Michael Pollara, 46, and Margaret Pollara, 70, were tracked down because of their use of a rewards card, police say. Police in Florida say they have busted a mother-and-son team whose goal was to steal thousands of items from toy stores in every state and then sell them online for millions of dollars. 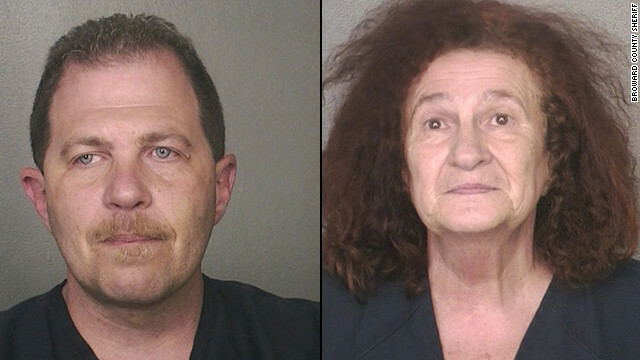 Police say Michael Pollara, 46, and Margaret Pollara, 70, would go into toy stores and pick out big boxes containing cheap toys, then replace the cheap contents with more expensive toys including Harry Potter Lego sets, Leap Pads, and InnoTabs. They would then go to the checkout line, where cashiers would ring up the box for the marked price, not knowing that inside were toys worth hundreds or thousands of dollars, according to police. "(Michael Pollara) made it a goal of his to steal from all 50 states within one year, which he was very proud of," Broward Sheriff's Office Sgt. Rick Rossman said during a press conference. The pair had stolen merchandise worth at least thousands of dollars from 139 Toys R Us locations across 27 states, according to the arrest affidavit. And then there were all the other stores, including Kmart, CVS and other retailers they had hit. "This is without a doubt the No. 1 prolific booster that we’ve ever come across," Rossman said. "He basically is a one-man show. His mother participated in some of the thefts." Police opened an investigation that involved undercover surveillance and tracking of the pair after a theft report was made in May by a Toys R Us store in Boynton Beach, Florida. When officers began investigating the theft case, they noticed a purchase was made with a loyalty/rewards card. And that's what did Pollara in. When police looked up the rewards card they traced it back to a woman and noticed several purchases in a number of states. Police then began tracking all of the purchases made using the loyalty card around the country as well as at the 31 Toys R Us stores in Florida. "Michael traveled the entire country doing this. He was a one-man wrecking crew," Rossman said. "He called it the art of stealing." Pollara sold most of the items on eBay, police said. His records from the online auction site and PayPal show that he sold the items under accounts named LineMart or Buymart-USA. Those two accounts alone took in a total of $909,000. That money was apparently used to travel around the country. "He wanted to personally thank CVS for paying for his vacation to Hawaii in February," Rossman said, reporting what Pollara said during questioning. "(Shoplifting) supports his travel around the world." A spokeswoman for the Broward County Sheriff's Office said that when police showed Pollara a map of all of the places they had connected him to, he told them the map wasn't right - that he had hit more stores than that. "He's been stealing like this every day for 10 years," Rossman told reporters. "For 10 years this is what he's done." Police began following the pair, and an unknown man present during the thefts, as they hit different stores. The pair was arrested on Thursday. Michael Pollara was charged with one count of dealing in stolen property, five counts of grand theft, four counts of criminal conspiracy and two counts of felony petit theft, according to the arrest report. His mother is facing one count of organized scheme to defraud, two counts of grand theft, two counts of criminal conspiracy, and one count of theft. Police have not yet arrested the third person. The pair remain in jail. It is unclear if either has hired an attorney or had one appointed by the court. Filed under: Crime • Florida • U.S.
She has a smirk on her face. I bet the photographer said "smile"
Toy stores should use that tape you find on boxes that has a type of industrial strength string running through it (4-5 strands side-to-side). If the box is opened, the seal would be broken and the casher would notice. If the seal was intact, it meant the box was not opened. Use take that is the same length and if pulled off, it would take some off the box cover with it. To me, sure, there is a chance of repairs to boxes idiots opened in the store, but it keeps this from happening. Also – how is it they are able to bring in items > open the boxes > take things out > stuff things in > and all w/o being easilly detected? (Glad they were caught btw). Magnificent site. Lots of helpful info here. I'm sending it to some buddies ans additionally sharing in delicious. And naturally, thank you on your sweat!